As a CareFlight doctor, I know that without warning, someone’s day can turn from ordinary to terrifying. We are trained to handle the worst situations. 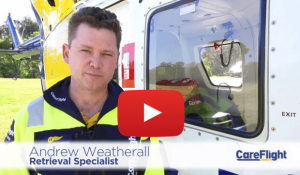 Today, I’m sending you the video message below to thank you for your amazing support in making sure that CareFlight is always ready to fly to the rescue of Australians in need. Knowing you’re standing with us as a Support Crew Member makes a big difference. Thank you for helping us to be there when we are needed most. This email was sent to me by CareFlight as I am a Support Crew Member. A recent survey just revealed the # one thing that people were happiest for in 2016. They’re glad the election is over! I’m sure you may agree. Yet, from the news lately, I have a feeling things are just getting warmed up. Wouldn’t it be nice to just get away from it all for a few days? accommodation will be taken care of by the company. How awesome! What is the criteria to qualify to this event?? You must be an ASCEND member. by registering at the bottom of this article. Well, when you come to our ASCEND event in Maui, you can! Imagine… 4 days in paradise learning the top business secrets behind many of our 7-Figure members. If you study the most successful people in the world (which I have for decades), one thing they have in common is their ability to completely unplug. In fact, Bill Gates has repeatedly said that he sets aside a full week every year where he goes to a resort and does nothing but read every trade and technical magazine he can find. He stated that this allowed him to have a broad view of the entire industry and it’s what allowed him to keep Microsoft competitive for so many years. As I’ve said before… the quickest road to success is to model those who are already there. In March, take a page from the Bill Gates playbook, unplug and come immerse yourself in the latest, greatest tools, techniques and systems in our business today. It’s the sure way to guarantee that 2017 is vastly different from last year. There is also an issue as with an affiliate program which is set up to benefit both the program owner and the affiliate. Each one contributes to the success of the program. Actually don’t ever kid yourself martyrs and victims, it is the programmer that spent the most money developing their product and their program, and has the most expense in maintaining it for affiliates; so just pay your little fee and be glad you can get in on it. The problem is you may be the type of character to blame them if you fail even if you know darn well it is because you are actually lazy and expected something for nothing. You didn’t even really try.